What if my floor joists are not level? There are two different ways to go about this. If your floor joists are only off by 1/4-inch to 1/2-inch, you can install the top hangers directly to the floor joists as stated in the installation instructions. When you have all the top hangers and cross tees installed, you can then go over the grid and back out the screws in the top hangers to adjust for the uneven floor joists. If your joists are off by more than 1/2-inch, you will need to shim your joists so they are level. Then you can begin installing the top hangers and cross tees. What kinds of tiles can I use with CeilingMAX? With the CeilingMAX system, any standard 15/16-inch 2×2 or 2×4 flat or revealed tile can be used. (Revealed panels are those with the 1/4-inch lip around the edge of the panel). ACP’s Classic Tin Style Tiles can also be used with the CeilingMAX system. How do I remove a tile once the ceiling is installed? To remove a tile once the ceiling grid is installed, you will first need to unsnap a runner on one side of the tile. To do so, you will need to start at the end of the runner and pull down. The runner will pull away from the top hanger, similar to a zip-lock bag. When you have the runner unsnapped, you will then be able to rock the cross tees and remove the tile(s). After you have the runner removed, you could also back out the screw in the top hanger near the tile you would like to remove. This would allow you to twist and flex the top hanger to get the cross tee and tile out. After your work behind the tile is complete, (screw the top hanger back into place if the screw was removed), slide the tile back into place, once again rocking the cross tees, and snap the runner back into the top hanger. How do I install lighting with the CeilingMAX system? Any type of lighting that can be used with a drywall ceiling can be used with CeilingMAX. Whichever type of light you choose, you must make sure that it is mounted or suspended from the floor joist, and NOT resting on the tile or the grid. Since CeilingMAX is made of plastic, it will not withstand the weight of the light. How far from the wall should my first top hanger be? If I need more than one top hanger to complete a row, do the top hangers need to meet on a floor joist? When installing the top hangers to the bottom of the floor joist, there is a good chance that a top hanger will end between the joists. In this case, you will simply abut a new top hanger to the end of the previous one, putting a screw through the new top hanger at the first available floor joist. You will notice that the ends of the top hangers will sag. As a temporary hold, you can cut a 6-inch piece of a runner and snap it over the seam between the two top hangers. When you get to the final step in the installation process (Installing the Runners), you can snap out the 6-inch piece and snap in a full-length runner (8-foot). Another option would be to install a 2×4 at the point where the two top hangers meet. You would then be able to screw the end of each top hanger to that 2×4. How does the cross tee fit into the pre-cut notches in the top hanger? The cross tee is designed to slide into the notches in the top hanger. The “triangle” portion of the cross tee slides in between the two edges of the notch. When the components are correctly installed, no portion of the cross tee should be resting above the top hanger. The cross tee must fit snug into the notch allowing no room for play between two top hangers. How far apart do my top hangers need to be? The top hangers should be one cross tee length apart. To accomplish this measurement, you need to use the cross tee as a measuring guide between the top hangers. DO NOT measure 24 inches on center, as you will notice a slight gap between the point at which the runner and cross tee should meet. The only way to remedy this problem is to take the entire ceiling down and reinstall. What is a dry line? A dry line is a string run from one end of the room to the other. It is an alternative to snapping chalk lines. In such cases where you need to snap a chalk line to align your cross tee notches, you may need to run a dry line if the cross tee notches fall between floor joists instead of on a floor joist. How do I cut border panels if I’m using a revealed tile? On a revealed panel, you will notice a 1/4-inch lip around the edge of the tile. If you need to cut a border panel, you first need to cut the panel down to the border size. To do so, measure from the wall to the front edge of the cross tee. Then lay the tile in the grid. Score the face of the tile along the edge of the wall bracket and pull the tile out of the grid. Line up a straight edge on the scored line you created on the face of the tile. Run a utility knife along the straight edge cutting into the tile. Then cut into the side of the panel dropping out the corner of the tile. Do I need to install my tiles as I’m putting up the cross tees and top hangers? The tiles do not need to be installed as you are putting up the cross tees and top hangers. You’ll first want to install all the top hangers and cross tees. Then you can go row-by-row installing the tile and snapping the runner. What do I do if I have a heating duct running underneath my floor joists? Can I use CeilingMAX if I have conduit or water pipes running below my floor joists? CeilingMAX can still be used on a ceiling that has conduit or water pipes running underneath the floor joists. There are two different ways to go about this. The first option is to shim your floor joists down below the interferences. The second option is to install the top hangers directly to the floor joists. As you are installing the cross tees, you will need to notch out the vertical portion of the cross tee so that it does not interfere with the pipes. Why would I need 25-inch cross tees for and where can I purchase them? If your border tile size ends up being exactly 24 inches or youd like to start with a full size tile and youre using full-sized tegular (revealed edge) ceiling panels around the perimeter of the room, you will need to order 25″ cross tees for your border (only). The 25″ tees can be purchased directly from us. Using 24 full-sized border tiles is a rare occurrence, as we recommend a balanced border; not unnecessarily starting with a full tile to the wall. See below for details. If you plan to use a revealed-edge panel, you will need to install the wall bracket with the long leg towards the ceiling and the short leg facing the floor. The standard 23-inch cross tees are going to be too short for your first row of tile against the wall. One option is to purchase 25-inch cross tees from us. The 25-inch tees are only needed against the wall where a full panel is being used. Next, measure 24-inch from the wall towards the center of the room and snap a chalk line. This line is where your first top hanger will be installed. After you have the first row of top hangers and cross tees installed, you can begin using the standard size cross tees for the remainder of the room. 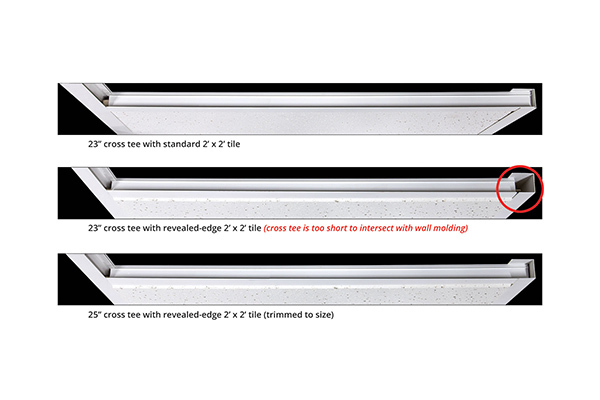 If ordering a 25-inch cross tee is not an option, the revealed-edge panels can be altered. A revealed-edge panel has a 1/4-inch lip around the edge. The lip on the panel that will be resting on the wall bracket can be cut deeper into the tile. This will allow you to push the tile further into the wall bracket, moving the top hanger closer to the wall bracket, and allow the standard cross tee to rest on the wall bracket and sit in the notch on the top hanger. If you choose to use a flat panel, you will want to install the wall bracket so that the short leg is toward the ceiling and the longer leg is facing the floor. Next, measure 24 inches from the wall out toward the center of the room and snap a chalk line. The top hanger will be installed on this chalk line. Inverting the wall bracket in this situation will allow you to use a standard cross tee from the wall bracket to the first top hanger. Order 25-inch cross tees online here. To order over the phone, please call 1-800-434-3750. Can CeilingMAX be installed on a vaulted ceiling? Yes. Since CeilingMAX is a surface mount grid system, the grid will follow the slope of the ceiling. The only thing that needs to be taken into consideration are the wall brackets which will need to be installed to the ceiling, NOT to the wall. However, this will cause a gap between the backside of the wall bracket and the actual wall. If the install is on a cathedral-type ceiling, we suggest installing wall brackets on each side of the slope break so that each wall bracket receives the panel and accommodates for the change in the ceiling levels. Can insulation be used with CeilingMAX? If you choose to use insulation, we recommend putting the insulation between the floor joists. Then install furring strips to the bottom of the floor joists to support the weight of the insulation. You can then install CeilingMAX to the bottom of the furring strips. We do not recommend using insulation directly behind the CeilingMAX as it is too heavy for the grid system. How does the cross tee attach to the wall bracket? The cross tees do not get fastened to the wall bracket in any way. They will simply lie on the edge of the wall bracket. Do I need to lay my room out so that I have even border tiles? The Room Planning section of the installation guide goes through step-by-step instructions on how to lay out your room with equal border tiles, giving you a more professional look. However, you do not necessarily need to have equal border tiles. You can start a room with a full panel and cut tiles only on one side. How do I install the wall brackets? On an installation where cut border tiles are present, the wall bracket will be installed so that the long leg is screwed to the ceiling with the short leg facing the floor. If your room is longer than 8 feet and you need more that one wall bracket, the second wall bracket will abut to the first wall bracket. At inside corners, the wall brackets can be mitered, inserted inside each other or abutted to each other. We suggest abutting the wall brackets if you are using a flat panel. Why isn’t there a 4-foot cross tee for the CeilingMAX system? The CeilingMAX system includes the top hanger (8-foot), the runner (8-foot), the wall bracket (8-foot) and the cross tee (2-foot). Since CeilingMAX is made of PVC plastic, a 4-foot cross tee only held up on each end by the top hanger, plus the weight of the tile resting on the cross tee, would cause the cross tee to sag. This is why a 4-foot tee is not manufactured for this particular system. How far does the CeilingMAX system drop when it is completely installed? When CeilingMAX is completely installed, it measures 1 1/8 inches from the bottom of the floor joist to the bottom of the grid system. Keep in mind that if you use revealed tiles, the face of tile will fall lower than the grid system. No. CeilingMAX is made of PVC plastic, which is very flexible. For this reason, the grids cannot be hung or suspended by wires. How do I balance a room if it isn’t a square or rectangular shape? We suggest that you take the largest area of the room and configure border tiles based on that. You may want to take into consideration the purpose of the room. For example, if the room is for entertaining you may want to balance the room so that the common area has equal border tiles. Can CeilingMAX be used outdoors? Yes. CeilingMAX components are manufactured from durable PVC material and are suitable for outdoor applications. Some deformation may occur in extreme temperatures due to expansion and contraction of the components. We recommend using solid colors or our Argent finishes in an outdoor application. Foil-faced finishes are not recommended for outdoor use as corrosion from salts can occur. Please contact us at customersupport@acpideas.com for more information about appropriate finishes for outdoor use.